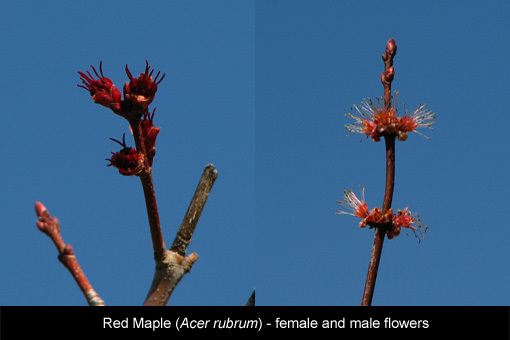 The swelling flower buds of Red Maples give some of the first colorings in spring, letting us know that most of winter is behind us. The open flowers reveal that they’re part of this group, too. Another dioecious American native is Kentucky Coffee Tree with the challenging name Gymnocladus dioica (jim-NOK-lad-us dy-oh-EYE-kuh, try it, it’s fun). Ungainly as saplings, they appear as nothing more than sticks but with handsome and large compound leaves. I have a liking for plants in the pea family and planted three small ones. I’m hoping I have both types but it will be many years in the future before I’ll know. If you noticed the similarity between dioecious and dioica then you’re quicker at perceiving patterns and relationships than I am. But once my attention was drawn to it I’ve been seeing this species name more often than I expected. 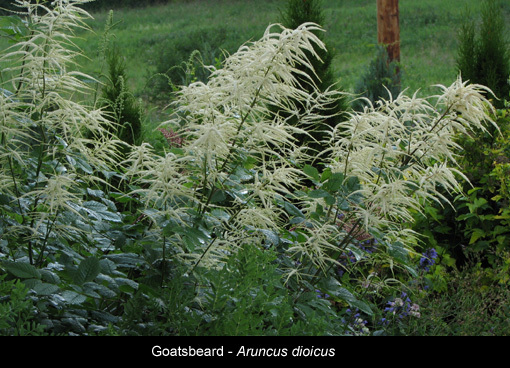 A commonly encountered garden perennial is Goatsbeard, Aruncus dioicus. Its extravagantly creamy flowers enliven shaded beds in summer and its commonness here allows it to escape close scrutiny. I feel fortunate that mine is a seed-grown clump rather than clonally (vegetative) propagated and double lucky to have both sexes. The female is the plant with the slender plumes on the far left in the above picture. After the flowers are gone the seedpods look as if small green chains have been threaded along the stems. 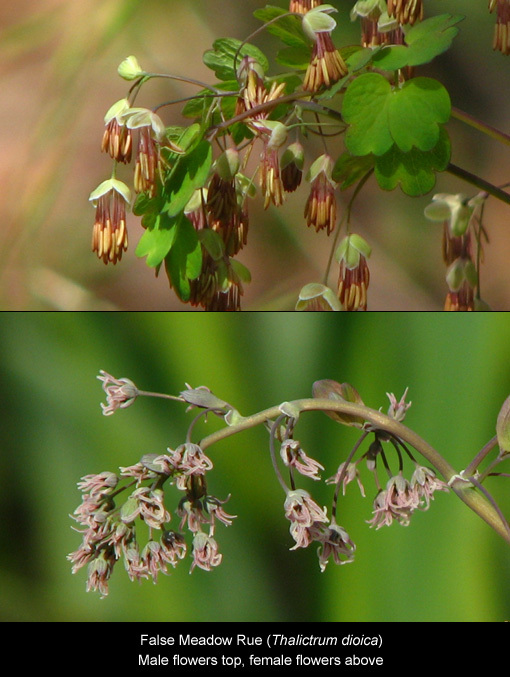 False meadow rue, Thalictrum dioica, is a native woodlander. It’s not locally abundant but I see it every so often, especially now that I’ve been looking for it. It doesn’t have the wow factor of the garden selections and hybrids but has its own grace. The flowers in close up remind me of sea creatures; the male are little jellyfish and the female are tiny octupuses or anemones. A more familiar plant is stinging nettle, Urtica dioica. We used to call it electric weed as we plucked young seedlings from cutflower beds. It was onerous and never-ending work but preferable to handling the mature stems. I’m crazy enough to consider growing it again because it is a preferred food plant of Red Admiral butterflies. If you’re in the mood for something different how about Glade Mallow, Napaea dioica? 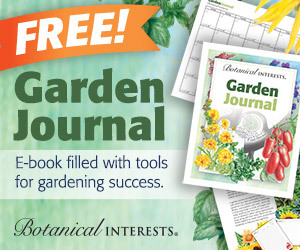 These can be big plants and in their preferred habitat of part shade and good moisture the leaves are large and the flowering stems are tall – up to ten feet. Small white flowers in clusters on top are reputed to be fragrant. 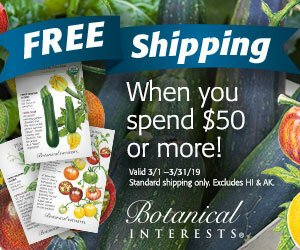 I haven’t grown this one yet but I keep eyeing seed lists and I know I’ll succumb at some point. Awesome post. Great photos on these flowers. Phenomenal close-ups of the rue! They made me realize that I’ve never fully seen it before. I’ve looked at it many a time, but apparently missed a whole lot during the flowering process. What a fascinating post. I’m going to pay more attention to dioicus and what I should be looking at, carefully, in those flowers.